Free shipping on UPSable supply orders over $50. 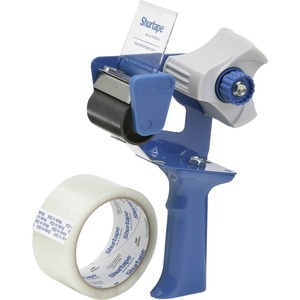 Handheld, packaging tape dispenser accommodates 2" wide tapes with 3" cores. Retractable safety blade reduces cuts and injuries. High-impact plastic handle with pistol grip provides an easy form fit. Dispenser features a tape break for one-handed operation, includes one 30-yard roll of tape and meets OSHA requirements. Tape's core is made using 100 percent post-consumer recycled material. Packaging is made from 100 percent recycled content. About Haskell New York Inc. Through our GSA Schedule 75, Haskell is authorized to sell to government agencies such as Social Security, the Dept. of the Interior and even the Department of Defense. Haskell is also listed on FedMall and supports the AbilityOne program. AbilityOne provides employment opportunities to people with major disabilities including the blind, wounded veterans and people living with PTSD. For three generations, the small family owned business has survived world war, the emergence of the super-stores and transition to an online world by providing personal service and great products at reasonable prices. Haskell is also a member of the TriMega Purchasing Association and can quote specialty items like apparel and branded promotional items. Call for competitive quotes. Installation services available upon request.